It was nice, for once, to walk into a movie having not watched a single trailer, having not read the source material, and literally having zero to no expectation for what was about to be delivered. This type of movie-going experience doesn't happen often in the age of the twenty-four hour news cycle, especially when large portions of that cycle are dedicated to updating fans on every inch of a new movie's production status. The truth of the matter though, was that I personally had zero interest in Captain Underpants, his books, or his potential movies and chalked this initial feature up to being nothing more than a relatively cheap and easy cash grab to capitalize on the popular book series by Dav Pilkey. Still, even this kind of "brand recognition" mentality seemed like it wouldn't serve DreamWorks Animation in the way they might hope as the last I'd heard of the Captain Underpants books was when my younger brother discovered them in elementary school as they gained popularity...in the late nineties. There have been some rather large gaps in the publishing of Captain Underpants novels, but apparently Pilkey is still going strong today and given it's been almost two years since the last Captain Underpants adventure I'm assuming fans might have even been excited for the prospect of a new Underpants adventure not to mention the first one they might experience on the big screen. 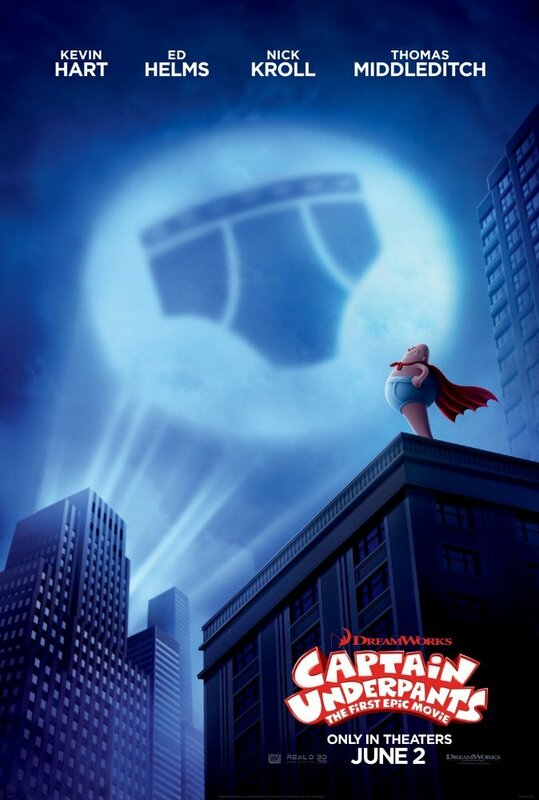 And so, Captain Underpants: The First Epic Movie is here and while, again, I couldn't have been more unaware of what a movie that had "underpants" in the title could possibly deliver it actually is a rather inspired and genuinely funny piece of entertainment. Granted, this is all very silly and rather outlandish while capitalizing on the fact it knows it's capitalizing on potty humor, but nonetheless the titular character and his creators, elementary school students George (Kevin Hart) and Harold (Thomas Middleditch), burst through scene after scene with tireless enthusiasm and a joy for life and all its possibilities that's downright contagious. Though I have no idea how faithful this film is to a certain novel or the series in general I have to imagine that what is captured on screen is very close to the spirit of Pilkey's series as the most vital ingredient in Captain Underpants is that of getting the audience to view these adventures through the minds of George and Harold and it is in this regard that I came to not only appreciate what Captain Underpants was mining, but kind of adore it for doing so. A kind of generic description given to a movie by a critic that is undoubtedly genuine, but completely cliché is the one that goes, "it made me feel like a kid again!" Despite the fact this rote comment now feels more like an aside than an actual compliment it perfectly encapsulates exactly how I felt after walking out of Captain Underpants and his first epic movie. Now, so that my reaction doesn't end up coming off as one of those dismissive, but appreciative comments I will be happy to explain why Captain Underpants indeed made me feel like a kid again. Chiefly, and this is coming from someone who'd never touched a Captain Underpants book prior, is the films ability to tap into the psychology of a kid and how there are seemingly too many ideas to contain within the walls of your ever-developing brain. The film executes such a thought process by not only establishing the friendship and collaboration that is possible between George (the storyteller) and Harold (the artist), but by coming up with different visual styles and interpretations of their ideas to the point the film genuinely transports older viewers back to a time when all could come true while no doubt lending inspiration to the target demographic to create whatever might come to mind-even if it doesn't look like anything they see anyone else doing. To this point, the animation style of Captain Underpants in general is different from what we're accustomed to seeing in theatrically released titles, but it diverts from this style even further when the film calls for Harold and George to express how they're feeling or what outlets they might utilize to let their imaginations run wild. One of the more memorable of these moments comes when the despicable Principal Krupp (voiced by Ed Helms) threatens to separate Harold and George from one another and the two of them play out in their heads how quickly their friendship will dissolve via sock puppets. And it's not just that director David Soren (the underrated Turbo) utilizes quirky styles and methods to infuse his feature with energy, but that he uses such techniques to elicit more comedy from the situations presented. The sock puppet bit is funny by the look of it alone, but that the film chooses to exercise this look during what is more or less the film's most dramatic moment automatically informs the tone the overall movie is shooting for-and it works. Harold (Thomas Middleditch) and George (Kevin Hart) are surprised by the appearance of their creation in Captain Underpants (Ed Helms). Adapted from Pilkey's epic novels by Nicholas Stoller (Forgetting Sarah Marshall, The Muppets) the film not only thrives on the honesty of our two young protagonists and the heights of their imaginations, but by the fact it is legitimately funny. George and Harold are legitimately funny and inventive, and witty, and they are the type of kids you'd want to be friends with in elementary school despite the fact they can sometimes take their shenanigans a little far. It is to the credit of both Hart and Middleditch that neither of their performances ever come off as performances, but rather and rightfully so as two guys hanging out just having fun. Every set of circumstances they find themselves in is an opportunity to see how they might put their own twist on it and while the film certainly has an arc for these characters and hits some familiar beats as far as super hero movies are concerned, it is the characters of Harold and George and their creations that leave the biggest impressions. If Captain Underpants: The First Epic Movie did nothing else (and it does) it would have at least made me curious about what George and Harold might think up next, but as it stands DreamWorks has crafted a kind of zany and somewhat experimental animated film that almost feels like a student film in that it's pulling out all the stops because this might be the only chance they have to pull out all the stops. Still, Captain Underpants feels like a smaller-scale effort, especially when compared to other summer animated offerings, but this only gives the film another layer of charm in many ways. Aside from Hart and Middleditch, you have guys like Ed Helms (The Hangover) and Nick Kroll (The League) who are seemingly having a blast as they create these over-exaggerated voices that adhere to what classic archetypes of what the characters they are playing would sound like. Helms, as the titular Underpants as well as Principal Krupp, finds the grandiose Saturday morning cartoon cadence in his voice and runs with it while Kroll, as Professor Poppypants (yes, that's his name and yes, it's still funny), jacks up the villainy to eleven as this kind of Austrian mad scientist that wants to steal away children's laughter by posing as an elementary school science teacher. Jordan Peele, Kristen Schaal, and Brian Posehn also lend their voices here in an effort that is altogether fun, entertaining, and ultimately smart...mainly for owning up to how dumb it is.